I'm trying to do an image viewer that when the user clicks on the image, the image is "cropped-out" and reveal the complete image. 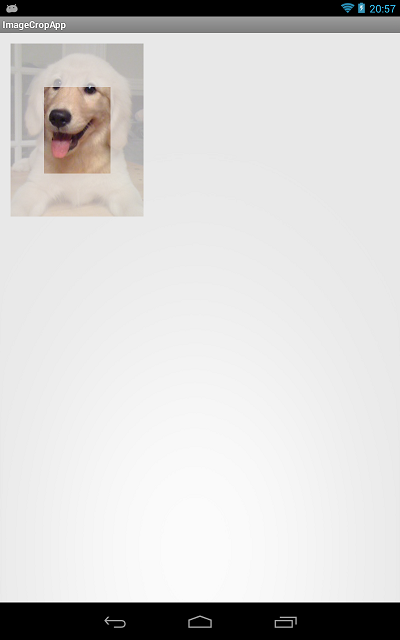 For example in the screenshot below the user only see the part of the puppy initially. But after the user has clicked the image, the whole puppy is revealed. The image faded behind the first shows what the results of the animation would be. Initially the ImageView is scaled to 50% in X and Y. And when the user clicks on the image the ImageView is scaled back to 100%, and the ImageView matrix is recalculated. I tried all sort of way to calculate the matrix. But I cannot seem to find one that works with all type of crop and image: cropped landscape to portrait, cropped landscape to landscape, cropped portrait to portrait and cropped portrait to landscape. Is this even possible? Here's my code right now. I'm trying to find what to put in setImageCrop(). Edit: It's worth mentioning that scaling the matrix linearly will not do. The ImageView is scaled linearly (0.5 to 1). But if I scale the Matrix linearly during the animation, the view is squish during the animation. The end result looks fine, but the image looks ugly during the animation. I realise you (and the other answers) have been trying to solve this problem using matrix manipulation, but I'd like to propose a different approach with the same visual effect as outlined in your question. In stead of using a matrix to manipulate to visible area of the image(view), why not define this visible area in terms of clipping? This is a rather straightforward problem to solve: all we need to do is define the visible rectangle and simply disregard any content that falls outside of its bounds. If we then animate these bounds, the visual effect is as if the crop bounds scale up and down. Luckily, a Canvas supports clipping through a variety of clip*() methods to help us out here. Animating the clipping bounds is easy and can be done in a similar fashion as in your own code snippet. The real 'magic' is the added line to the overridden onDraw() method, where the given Canvas is clipped to a rectangular area defined by mClipRect. All the other code and methods are mainly there to help out with calculating the clip bounds, determining whether clipping is sensible, and the animation. The result is the inner image remains the same resolution, always. However you also mention portrait/landscape differences, so this gets a bit more complicated. I find the most difficult thing in cases such as this is to solidly define what you want to have happen in all cases. I'm guessing you're after a grid of small thumbnails, all of the same size (which mean they all have the same aspect ratio). You want to display images within the thumbnail containers of different aspect ratios and size, but zoomed in. When you select an image, the borders expand (overlapping other images?). There's the constraint that the shown image must keep the same resolution. You also mention that the complete image must be visible after selecting it, and twice the thumbnail size. This last point raises another question - twice the thumbnails height, width or both (in which case do you crop or scale if the image aspect ratio doesn't match). Another issue that might crop up is the case when an image has insufficient resolution. //Then set the origin (top left corner). For API 11+, you can use setX() or setY(). "x: " + Float.valueOf(ViewHelper.getX(parent)) + ", " +//needs to include a decimal in the string so droidQuery knows its a float. "y: " + Float.valueOf(ViewHelper.getY(parent)) + //needs to include a decimal in the string so droidQuery knows its a float. $.noop());//don't do anything when complete. 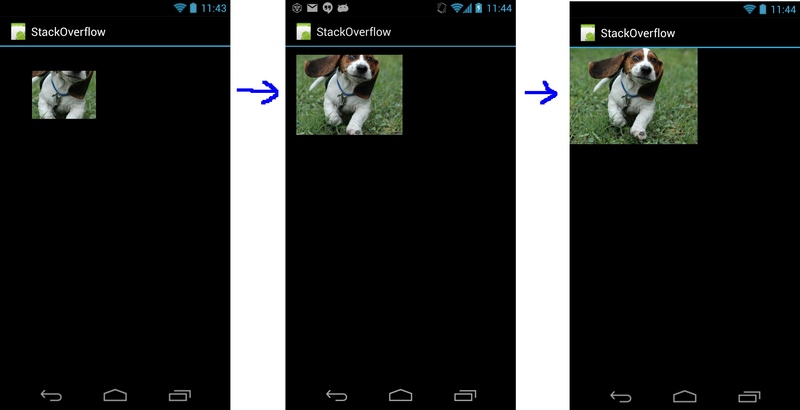 "x: " + x + ", " +//needs to include a decimal in the string so droidQuery knows its a float. "y: " + y + //needs to include a decimal in the string so droidQuery knows its a float. Not the answer you're looking for? Browse other questions tagged android graphics matrix transformation objectanimator or ask your own question. Why does calling setScaleX during pinch zoom gesture cause flicker? How can I scale/clip a drawable to the largest axis?